is an Assistant Professor in the Department of Historical Studies at Southern Illinois University Edwardsville. She earned her bachelor's degree in history from Dillard University in New Orleans, Louisiana and completed her graduate work at Cornell University in Ithaca, New York. 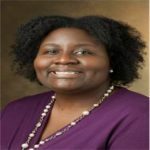 Dr. Harris specializes in 20th century African-American history, with a particular interest in the long black freedom struggle and the contributions of black women. Dr. Harris is currently at work on her first book-length project, a revision of her doctoral dissertation entitled, Surging Towards Freedom: Black Women and the Black Freedom Struggle in Oakland, California, 1850-1940.